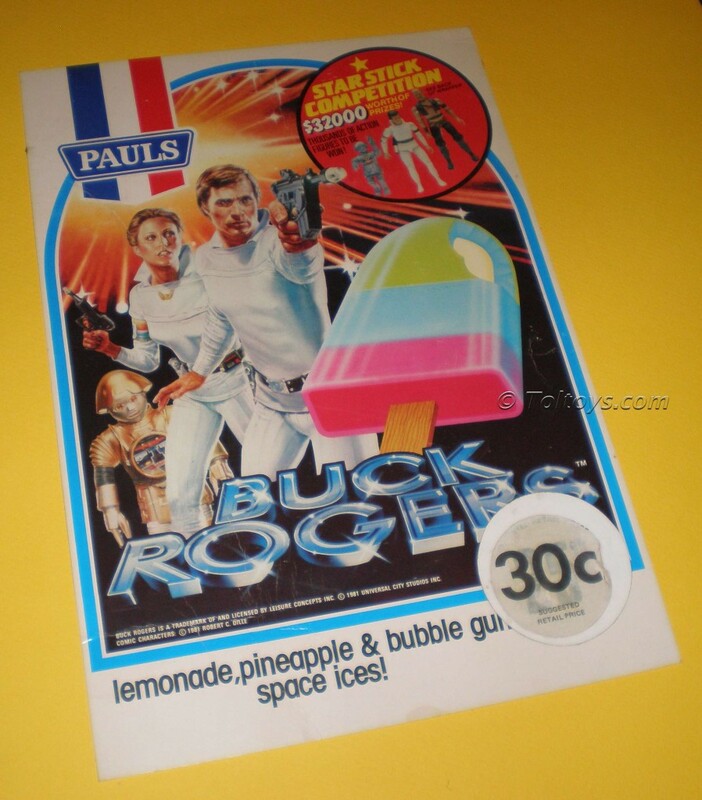 In 2007 I showcased the take-home box for Paul’s Buck Rogers ice creams, featuring the Star Stick competition for MEGO Buck Rogers action figures. Since then I’ve been lucky enough to track down both the Milk Bar store dislay and an example of the wrapper, so I’m going to call that a complete set and move on! 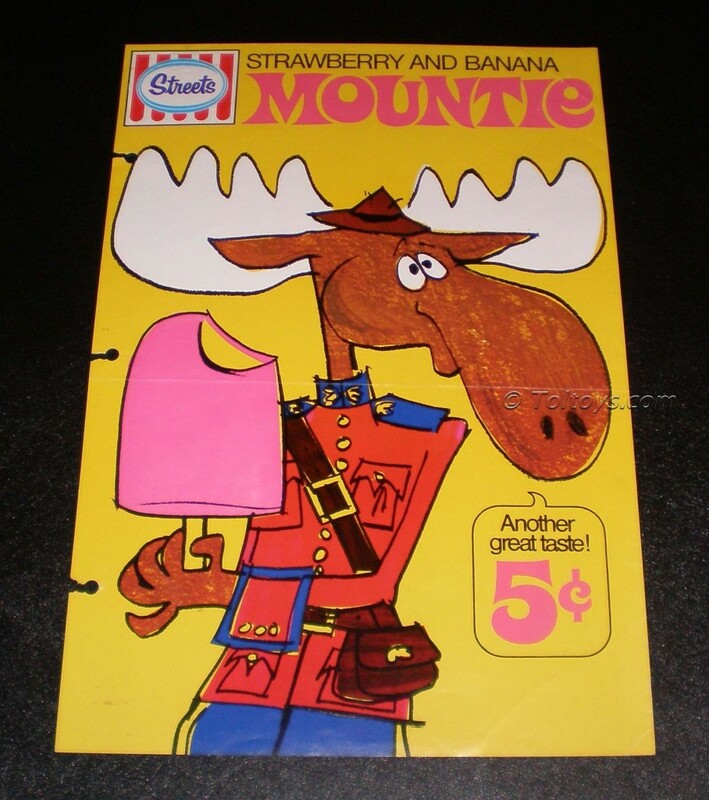 Streets Mountie Ice Creams – Bullwinkle the Moose? 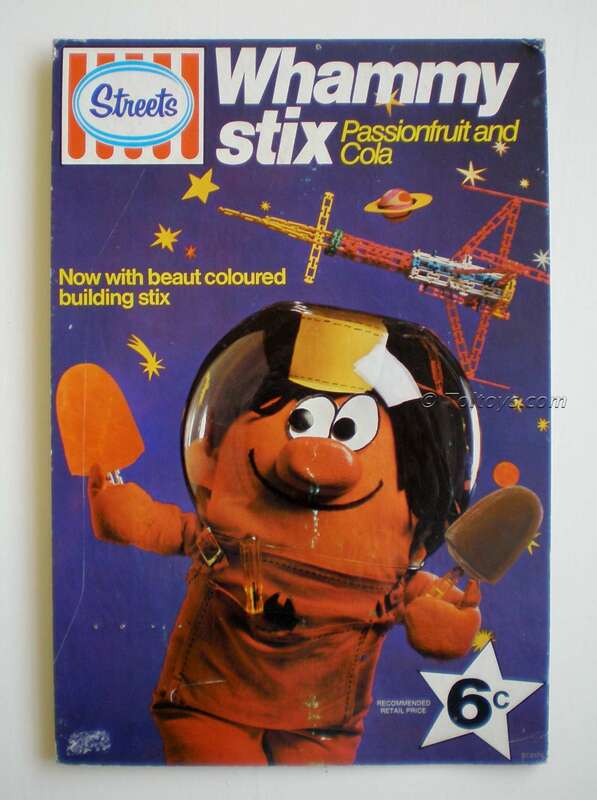 The 5c price point on this Australian Milk Bar store display for Streets Mountie ice creams suggests it is from the early 70’s. 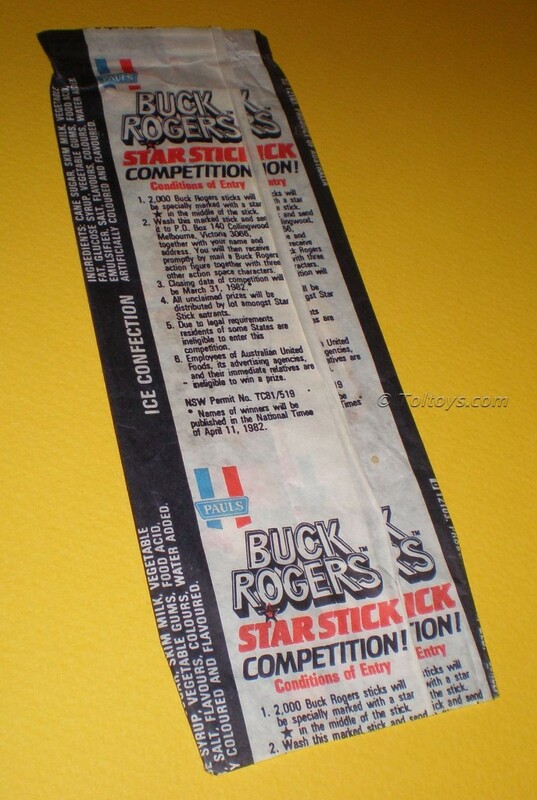 That also happens to be when I remember watching a lot of Rocky & Bullwinkle on Saturday morning TV. A Canadian moose in a Mountie uniform – what a coincidence! 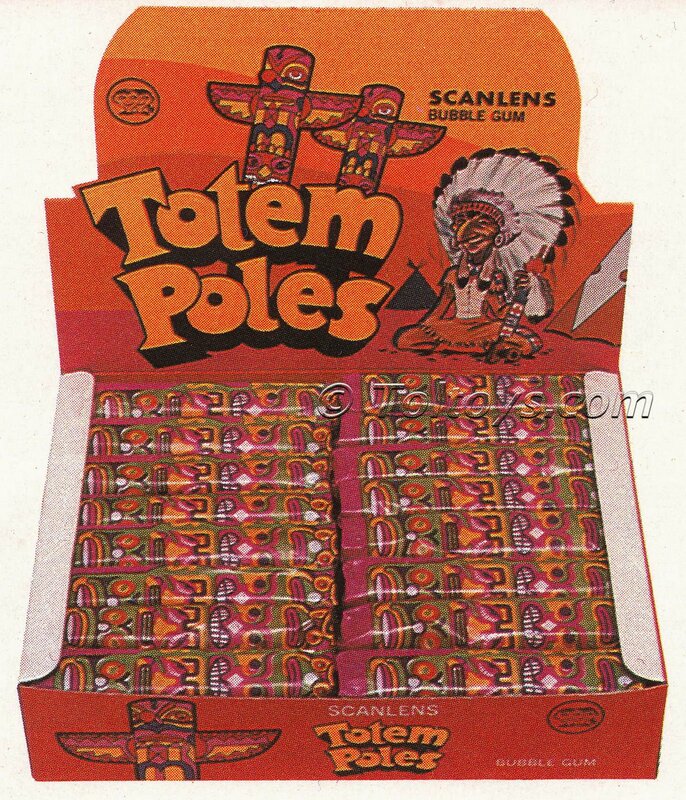 Anyone remember these? As kids I would presume that we’d never have known we were eating bootleg character confectionary, nor would we have cared! 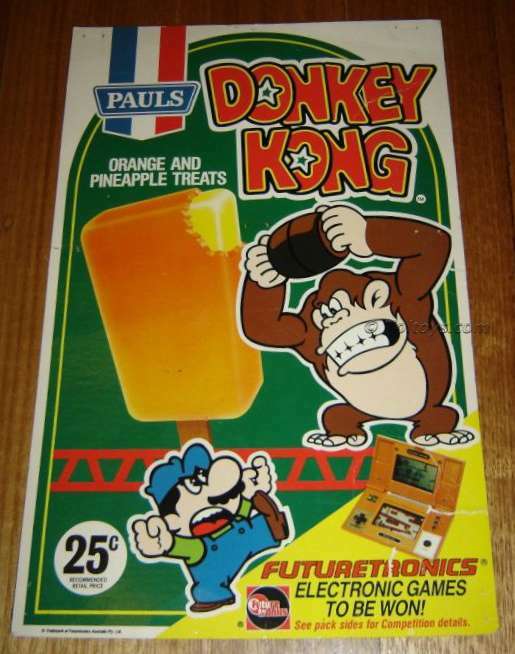 Here’s a ripping piece that escaped my clutches on Aussie Ebay a few years ago, an early 80’s Milk Bar Store Display for Pauls Donkey Kong Icey Poles (Orange and Pineapple Treats). 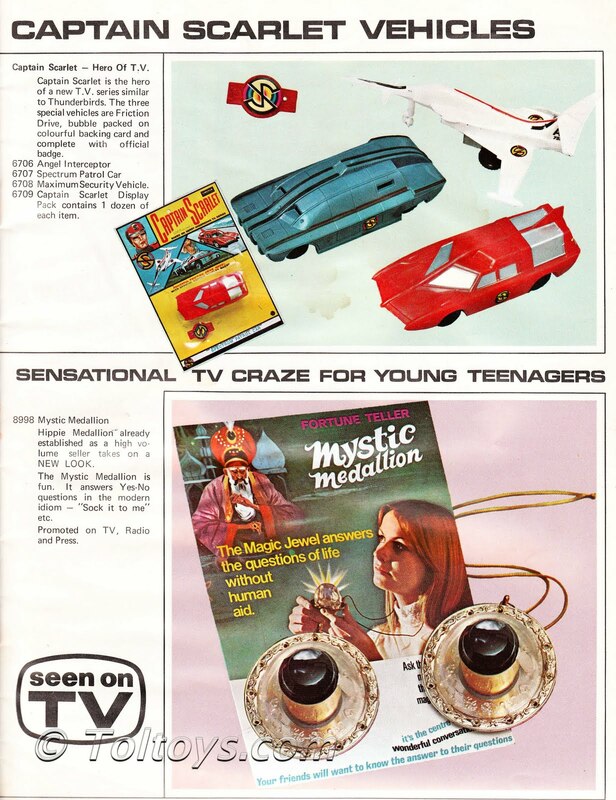 It features a competition for Futuretronics (The Australian Nintendo distributor) Game and Watch electronic hand helds. 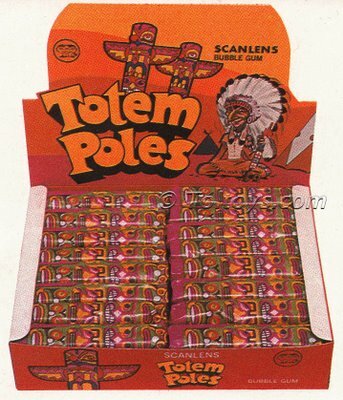 Did they come in take home packs I wonder. Anyone remember them? 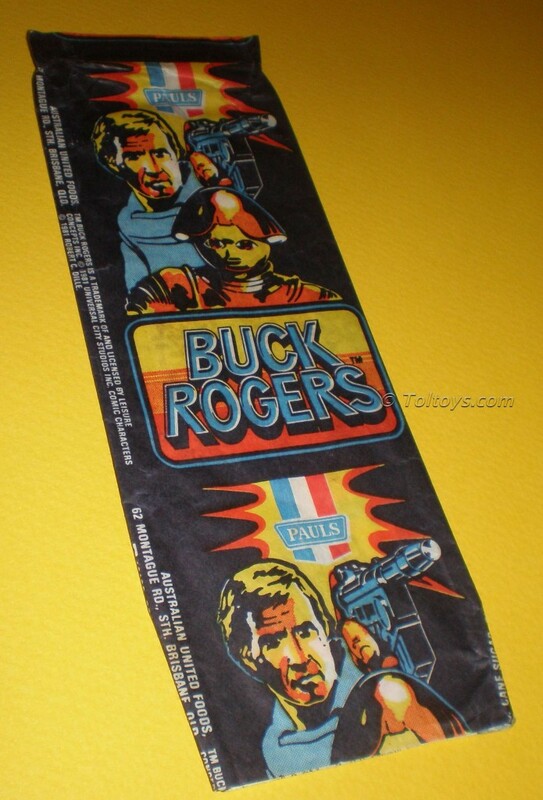 Remember those little plastic parachute guys that you hurled skyward or chucked off the Grade 5 balcony, and then stood entranced as his little chute magically popped open and floated the crazy commando safely back to Earth? 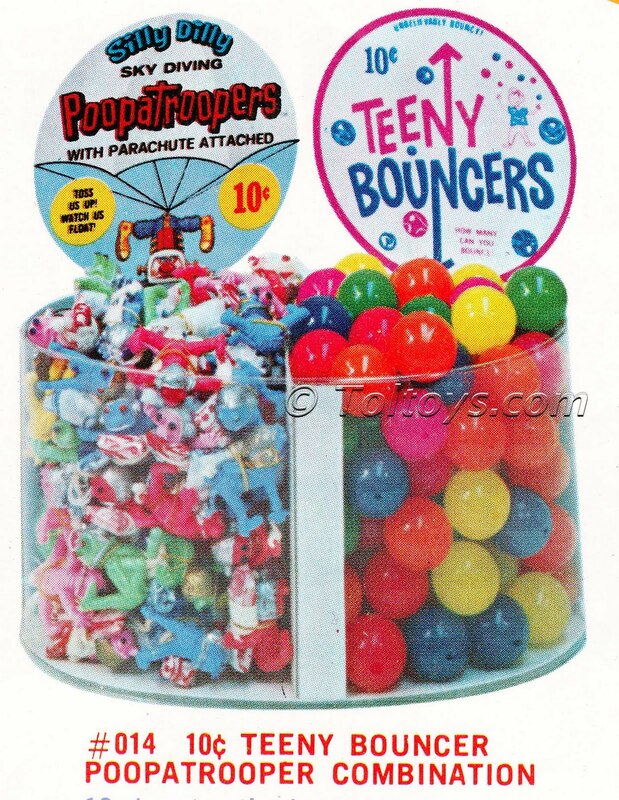 PoopaTroopers they were, just one of Imperial’s little plastic delights. 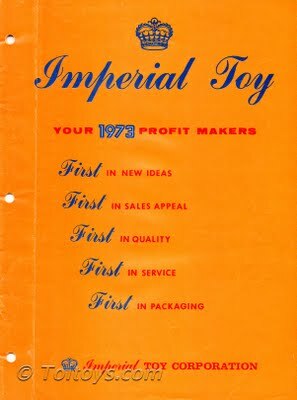 Imperial made many of those wonderful pocket-money plastic and rubber novelty toys that clogged pharmacies and supermarket checkouts from Melbourne to Montreal. 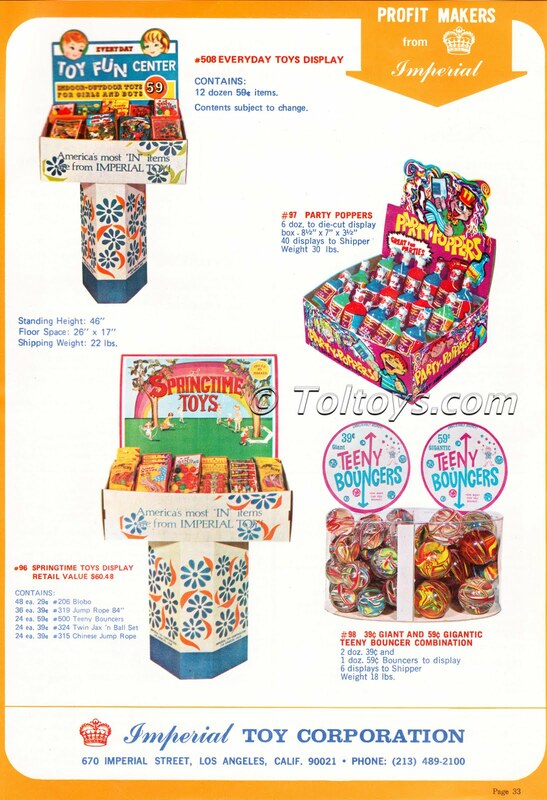 “Rack Toys” as they are officially known were often great little earners for the shop keeper and excellent sanity-preservers for Mum. I couldn’t begin to calculate how many Teeny Bouncers disappeared in my schoolyard back then, I wonder where they all went? In one of the greatest moments of serendipity the toy world has ever known, Imperial where able to pull of a visual slight of hand with the naming of their Hong Kong Gorilla (below), clearly aping the original Kong but wrapping themselves in the legitimacy of the manufacturing state of origin of their rubber gorilla! What a triumph! Beers all round on that day I’m sure. 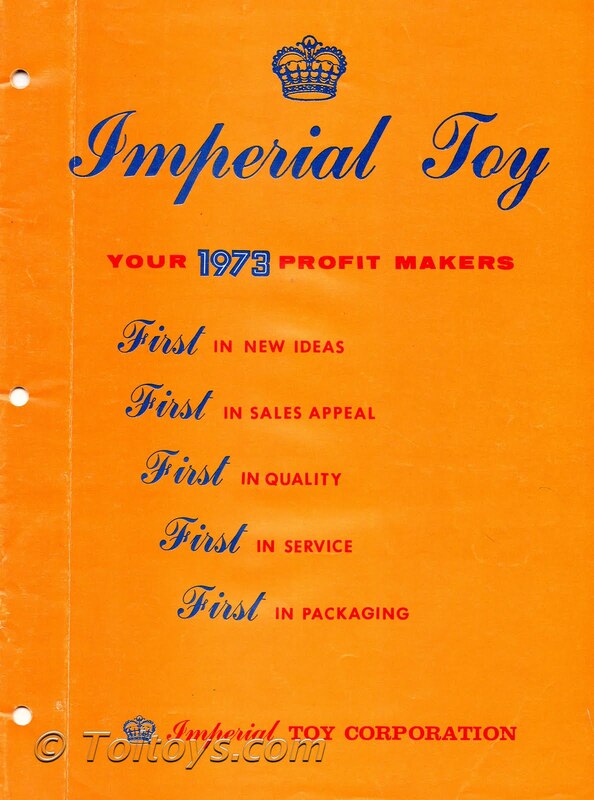 The visual merchandising of Imperial was a lesson in how it’s done. 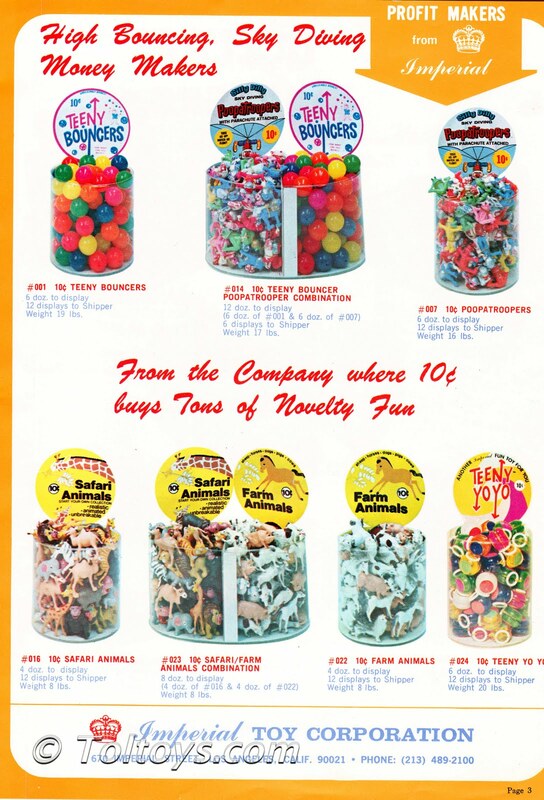 From full colour printed counter display boxes to self-supporting Toy Fun Centers like the example below, the products popped from the displays like a comic-book novelty page come to life. 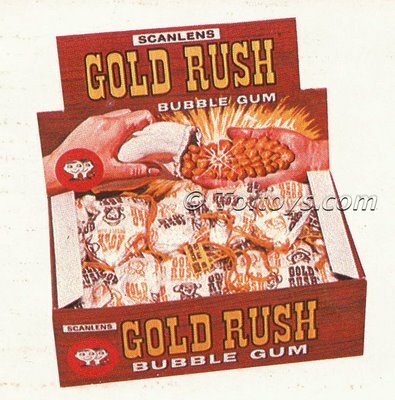 Kids could not resist nagging Mum for one on every visit to the shop. In Australia Imperial Toy debuted in Safeway Supermarkets with bubbles and blister-carded novelties, thanks to the work of John Hunter of Len Hunter Toys, who secured the Imperial agency on a trip to the New York Toy Fair in the early 1970’s. 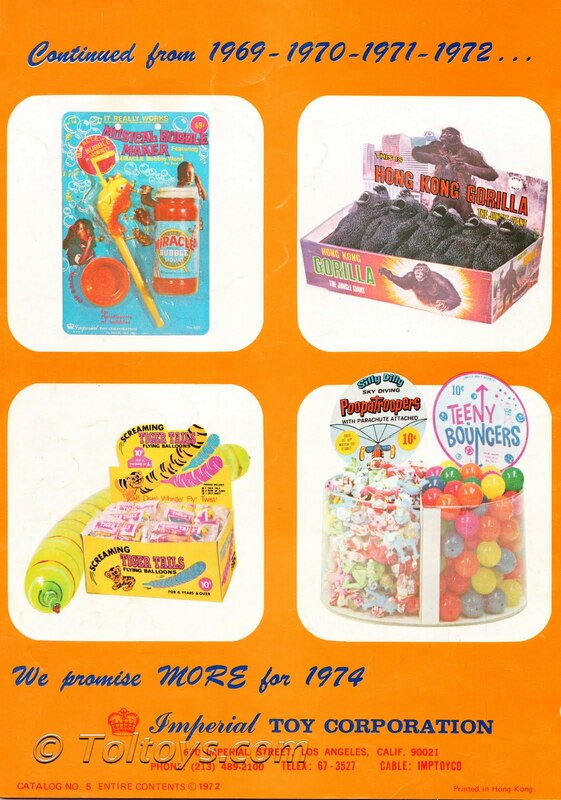 Good one John, the kids of the 70’s owe you a 21 Party Popper salute. 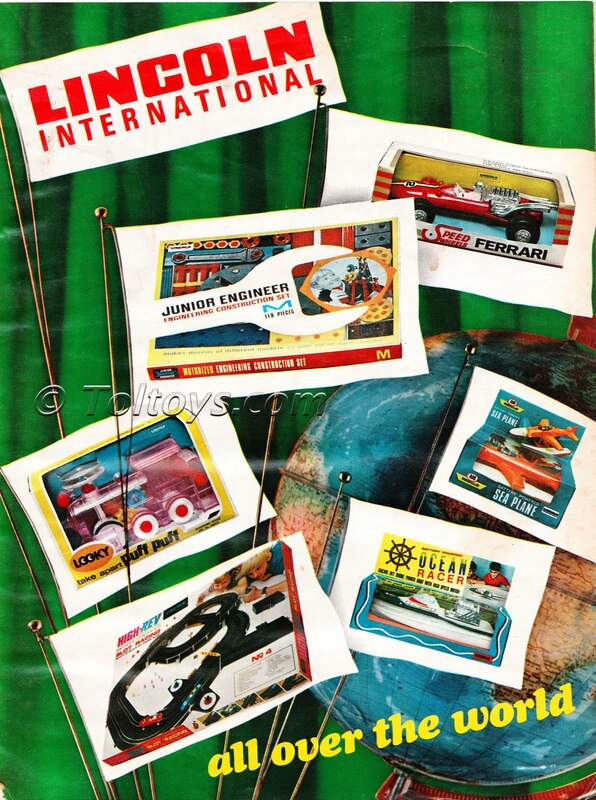 The New Zealand toy company Lincoln International were responsible for some of the coolest licensed (and unlicensed) toys of the 60’s and 70’s. 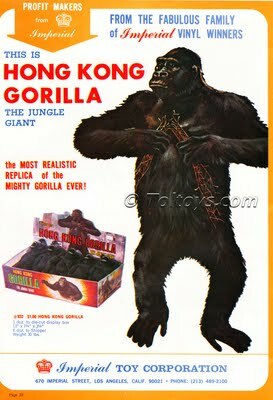 Best known for their 1966 licensed Batman range of ray guns, water pistols, friction toys and battery operated plastic vehicles, or perhaps for their goofy but highly desirable 1970’s range of Mego-Like 8″ Monster action figures, Lincoln went in hard with Gerry Anderson licences in 1967. Captain Scarlet promised great things for those toy companies hoping to match the success of Dinky and their Thunderbird die-cast vehicles, unfortunately whilst popular the Captain never had the impact of his Anderson stable-mates. Lincoln released three friction vehicles for Scarlet; The Angel Interceptor, Spectrum Patrol Car and Maximum Security Vehicle. Each was blister carded to a colourful but fairly flimsy card along with a plastic Spectrum Badge. The vehicles were packed flat on the cards, and the blisters were attached to the cards with staples. They are a tough find today loose or carded, I’ve never seen an Angel Interceptor in person but thanks to the diligent work of the Australian Powerhouse Museum there is at least one example stored away in perpetuity. 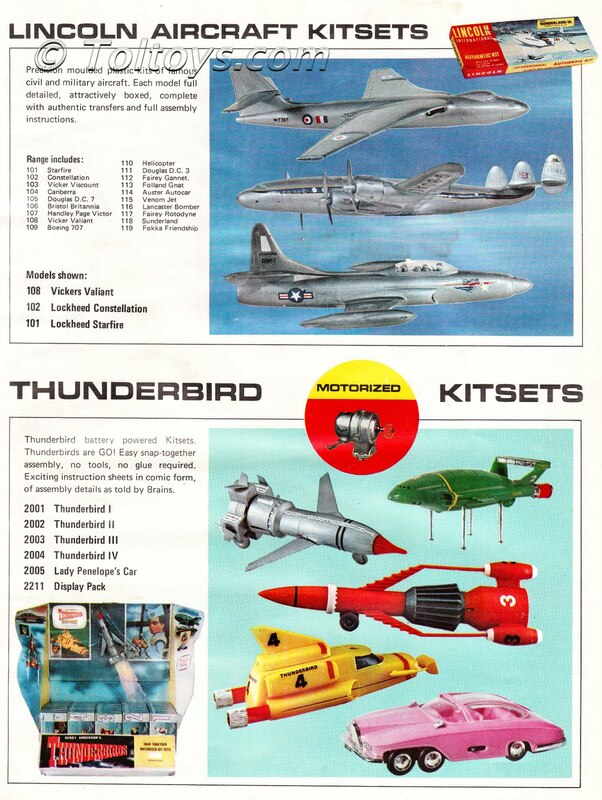 Much more common to find today are examples of Lincoln’s Thunderbirds motorized kits. These must have been big sellers since they turn up quite regularly on eBay and at auction houses such as Vectis. 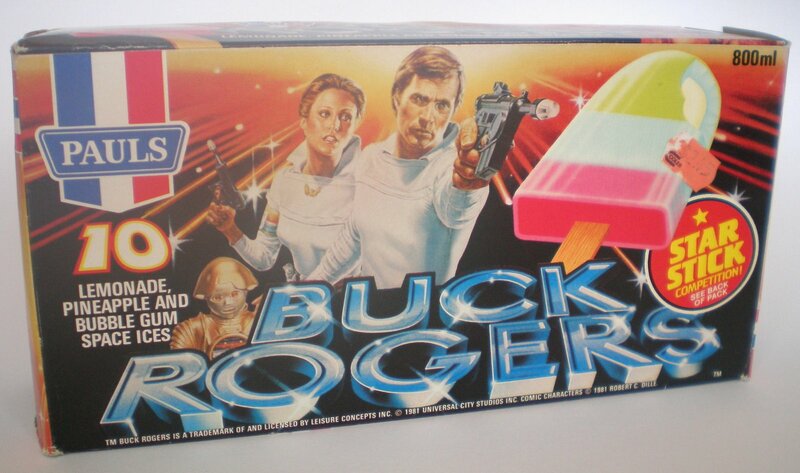 The vehicles are OK, but it is the box art that steals the show on these, nicely rendered images with the designated number on the right front of the box. 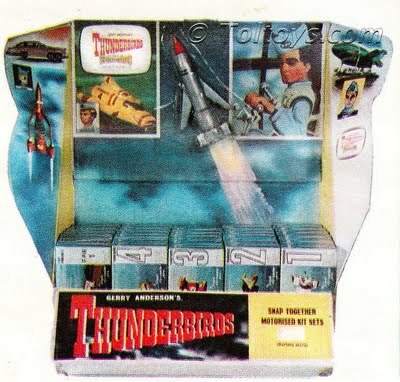 There would be many Anderson Thunderbird collectors out there who would dream of finding a full counter display pack like the one above, to my knowledge though none have ever surfaced.